Order in 12 Hours 47 minutes 16 seconds for dispatch today! - Rubber sole sticky in wet conditions with 3 times the abrasion resistance of competitor sandals. - Edge- lockers™ secure strap edges. - Additional lateral support ensures stability. - Triple-layer padded heel, arch and forefoot for unmatched sensation of cushion, comfort and support. - Bottom sole: Super abrasion A.R.T2™ rubber compound. - Mid sole: Impact absorbing molded EVA with anti-microbial agent. - Top-sole inserts: Hi grip A.R.T1™ rubber compound with anti microbial agent. - Straps: Soft and Fast-Drying™ Polypropylene tubular webbings. - Pads: Sweat management Drilex® lining, high grade 3mm PE close cell and durable 2tone PES fabric. Bought these because of the very positive review in Runners World mag and not disappointed: very comfortable, they appear to be extremely well made and look as though they ought to last several years of hard use. There's lots of adjustability in the (padded) straps, an antibacterial coating on the sole (I had to throw my last pair of sandals away after a wet camping holiday in Wales led to an odour that nothing could remove) and the sole has enough off road grip for hill walking and bouldering in the dry conditions I have tested them so far. The shoes arrived by Royal Mail 2 days after ordering so 5 stars for Jackson Sports as well. I have walked 1500+ miles in my last pair and would only have the same again. These are great if you want a good pair of walking sandles. Cannot write highly enough about them it's end of September now and I am still using them for the 6 miles a day with the dogs in the woods and fields. No leather so walking into water and paddling in the sea is no issue. They dry fast when wet and they are very comfy over rough ground. Can get a little slippy if the ground gets muddy but could not ask for more from a pair of sandles! 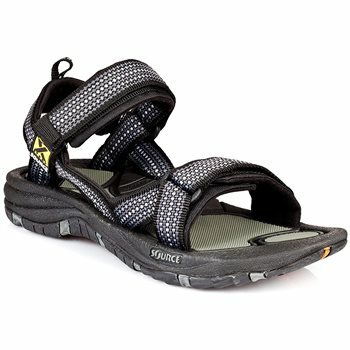 I have already got one pair of Gobi sandals and they have been the best, most comfortable sandals I have ever had. I intended to replace them soon, but at this price I decided to get them now. I have worn my sandals for the last three years, only changing into shoes when the weather turns really cold and returning to them as soon as the weather warmed up a little. One green dot has only just started to wear through.